Chairperson Newry, Mourne and Down District Council, Council Mark Murnin, Councillor Liam Reilly Cathaoire Louth County Council, funders/stakeholders contractor, local representatives at the Official Opening of the Carlingford Lough Greenway from Newry to Victoria Lock. Work has been completed on the section of the Carlingford Lough Greenway from Dublin Road Bridge in Newry through the Albert Basin site and along Middlebank as far as Victoria Lock – a distance of 5.7 kilometres approx. This linear section has been open for use by the public from 4 May 2018. 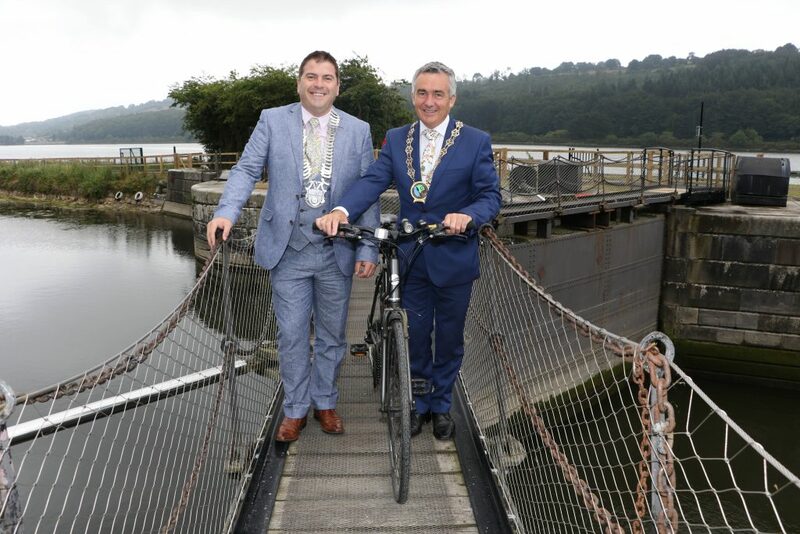 Chairperson Newry, Mourne and Down District Council, Council Mark Murnin, Councillor Liam Reilly Cathaoire Louth County Council walking the bike over Victoria Lock at the Official Opening of Carlingford Lough Greenway. Newry, Mourne and Down District Council Chairman, Councillor Mark Murnin said, “I would like to pay tribute to the staff in each partner organisation for their foresight and commitment in developing this genuinely cross border project and in securing a significant amount of EU funding for its implementation. I look forward to returning in the future to see the finished greenway which will greatly enhance our cross border region”. 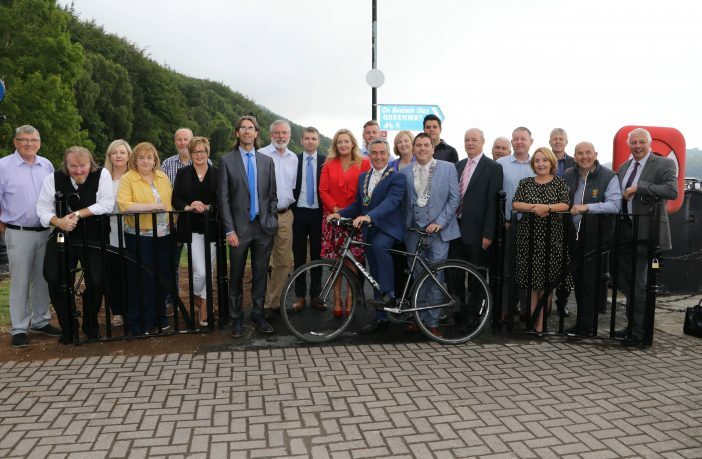 Pictured at the Official Opening of Carlingford Lough Greenway from Dublin Road Bridge in Newry through the Albert Basin site and along Middlebank as far as Victoria Lock a distance of 5.7 kilometres approx. 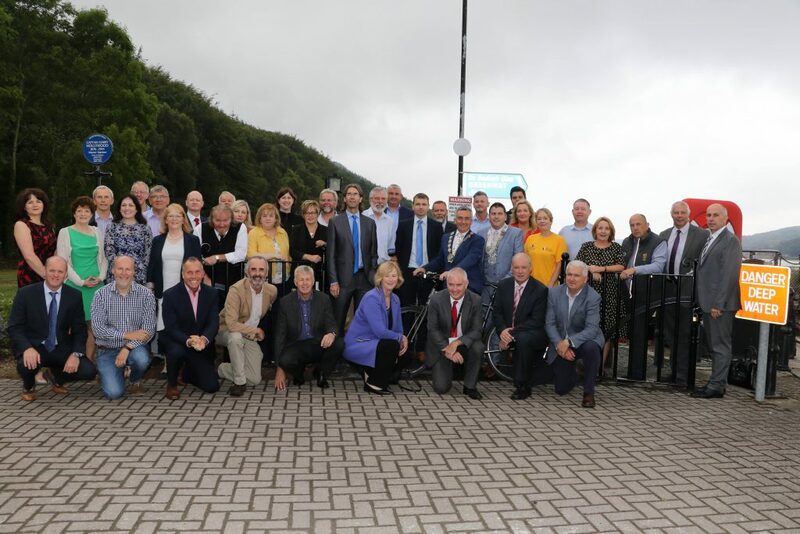 Chairperson Newry, Mourne and Down District Council, Councillor Liam Reilly Cathaoire Louth County Council, funders/stakeholders contractor, local representatives and guests.